Produktinformationen "MultiTech Conduit LoRa Gateway 4G Outdoors IP67 & AEP"
MultiConnect® Conduit IP67 Base Station is a ruggedized IoT gateway solution, specifically designed for outdoor LoRa® public or private network deployments. 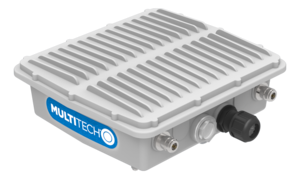 This highly scalable and certified IP67 solution is capable of resisting the harshest environmental factors including moisture, dust, wind, rain, snow and extreme heat, supporting LoRaWAN applications in virtually any environment. The enhanced MultiConnect Conduit IP67 solution can support thousands of LoRaWAN certified end nodes, including the MultiConnect® mDot* and xDot*. This flexible solution provides durable, low-power, wide area connectivity in support of M2M and IoT applications for both LoRa service providers and individual enterprises wanting to expand their LoRa network coverage. Designed for easy deployment, the solution includes a MultiConnect Conduit with a LoRa MultiConnect® mCard, IP67 enclosure, LoRa antenna to improve outdoor range and provides a choice of 4G-LTE or Ethernet backhaul options. It can be deployed as part of an existing telecommunications tower, individual stand or wall mount. Weiterführende Links zu "MultiTech Conduit LoRa Gateway 4G Outdoors IP67 & AEP"